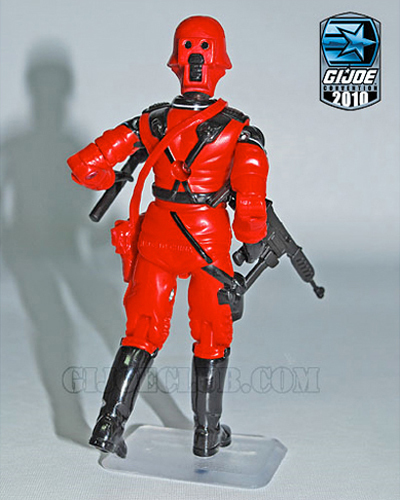 Red Shadow 2010 - Joecon Exclusive figure- BLOOD FOR THE BARON!!! Can't wait to add these guys to my collection. Here's a close up of the long neck. Click picture for more. got my box and bag set already ordered! It's red giraffe! A distant relative of giraffeshadow I made a while ago! Hellacool fig. That potato masher grenade is also quite a nice touch to boot. 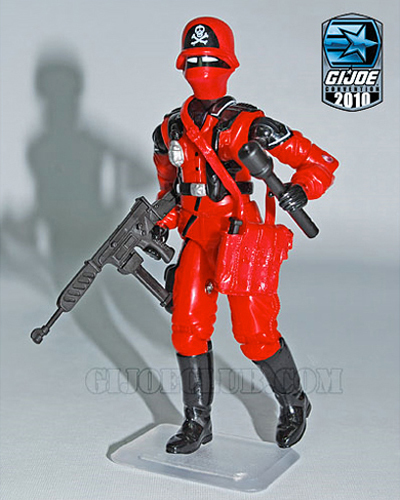 Don't know if anyone noticed this yet or not, but the club added a group shot picture of all the figures with their additional accessories....The Red Shadows have bazookas! No viewfinders on the bazookas?? That's got to affect their accuracy. Wondering now if they come with a bazooka, grenade and Beachhead gun. If so they're going to need more hands! Indiana Major's head still looks a bit too big and ginger for my liking! Love the way they all look displayed like that though!